Once the mastering series is finished and now that the mixing guide is (finally!) arriving the end, it's only natural that Audiofanzine asked me to extend this tale told backwards with a new series dedicated to recording. HOME MASTERING - ultimate guide (22 episodes) - Become a master in mastering. In your bedroom. After more than 20 weeks, the time has finally come for the last installment in our series dedicated to mastering at home. Today we won't be making any miraculous revelations. Instead, we'll give you one final piece of advice, "for the road." As you saw previously, the singer, as a performer, can be compared to an actor. 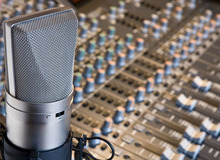 However, unlike a "traditional actor," the singer must only rely on his/her voice to bring to life his/her character within the framework of a recording production. A series like this wouldn't be complete if it didn't have an article dedicated exclusively to the recording tool by excellence: the microphone. For a change, I'll start today with some theory and then go on to close with a practical example.